With the kids grown and out of the house, the parents decided it was time for an overdue home improvement project. There was a lot of heat coming in from the old aluminum patio doors during the summer months and cold drafts blowing through in the winter. The SmartTouch® locks offered improved ease of use and security. The previous wood window frames had to be sanded and repainted every few years and some of the old wood windows had rotted. Over the years, the homeowners experienced problems with water damage as the caulking would crack and chip. The homeowners replaced all old windows and doors with the Milgard® Tuscany® Series vinyl product line. 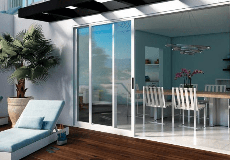 Compared with the old wood windows and sliding patio doors, Tuscany Series equated to lower-maintenance, which meant there was no longer a need to sand or repaint the windows. Simulated divided lite grids provided an aesthetically pleasing appearance. Overall, the homeowners remarked the windows dramatically improved the curb appeal of their home. What's your favorite part of this home remodel? Leave us a comment below.